As we talked about in “Is Your Church An Un-Church” and “10 Practical Areas God’s Children Should Govern,” YOU were made to rule and reign. You were made to govern as God’s representative on earth. So how do you go about having dominion in your life? How do you exercise the authority God created you to exercise? 1. Become a man or woman of prayer. God moves when His children pray. It’s as simple as that. The halls of history are marked through the ages with the lives of men and women who shaped history through prayer. These men and women rose early, stayed up late, and spent days and nights in prayer. If you want to govern in the spirit realm, you must learn to pray. Prayer is the conduit God has chosen to use to send His blessings into your life and mine. Prayer is also the conduit God has chosen to implement His purposes on the earth in churches, cities, and nations. If you want to govern in the spirit realm, learn to pray. 2. Stand on God’s promises. God’s promises in the Bible are for everyone who has faith to receive them, and who meets the conditions laid out with the promise. If you want to govern in the spirit realm, find God’s promises about your situation. After you have found them, begin to mediate on them. CHEW on them in your mind and spirit. This will build your faith. Then, as you chew on God’s promises, pray them back to God. Heavenly Father, Your Word says that all my children shall be taught by YOU personally, and that they shall have great peace. So Father, I ask that YOU would disciple _______ today. Show them the way they should go. Teach them. Shepherd them and watch over them. I cannot, but You can. And Father, I pray that _______ would have great peace. I pray that nothing would be missing in their lives, and nothing would be broken. Let them be totally whole on the inside and out. I just keep on praying this promise over and over, and I watch as God keeps His Word. Chew on them until you really GET them in your spirit. Pray them back to God. thank Him for keeping His promises. You will see radical results. 3. Be bold. Pray and believe God’s Word for what it says, even if it sounds too good to be true. For the earth will be filled with the knowledge of the glory of the Lord, as the waters cover the sea” (Habakkuk 2:14). He really meant that the earth WILL be filled with the knowledge of His glory–every square inch of it. And He really meant that He would pour out His Spirit upon ALL flesh–even upon people who don’t want it. You can and should read, believe, and PRAY God’s Word for what it says. Not for what tradition tells you it says. Not for what your flesh wants it to say, and not for what doubting people are willing to accept. If you want to govern in the spirit realm, you must take God at His Word… 100% of the time. 4. Call forth God’s purposes verbally. Command a thing to manifest. On earth as it is in heaven” (Matthew 6:9b-10). You know what’s interesting about this prayer? The words “come” and “be done” are not pleas. They are commands in the original language. Jesus wasn’t begging the Father to send His Kingdom or do His will. He was commanding it to come forth. Jesus commanded God’s will to happen. By speaking out God’s Word with His mouth, He manifested God’s plans on the earth. So what is God’s will in your situation? Use your words and command God’s perfect will to come forth! When you command a thing to manifest, it will. So make sure you’re commanding good and holy things. Never get over into witchcraft, but ALWAYS speak God’s Word and will into every situation. 5. Speak blessings over communication, people, events, and situations. I bless this email with fully performing God’s purpose for it in Jesus’ name. I bless this email with carrying the rhema word of God to _____. I bless this email with ministering the love of God to _____. Will of God, come forth in Jesus’ name! Love of God, be revealed in Jesus’ name! Purity of God, come forth in Jesus’ name! Unity of God, come forth in Jesus’ name! You would freak out if I had time to tell you the specific results that speaking blessings over just about everything I do has brought me. Let’s just say that when I started blessing my written communication, my favorable response rate became almost 100%. Also, the conversations I started having (after I began to speak blessings over my conversations in advance) would freak you out. Why? Because I’m putting the blessing of the Lord on everything I do. 6. Increase your faith, your intimacy with God, and your ability to hear God through fasting. Don’t get into fasting in order to manipulate God. Trust me; as I wrote about here in “Field Notes From My Fasting Failures,” it doesn’t work. Instead, learn to fast so you can draw closer to God. Fast so you can stare at His face. Ask Him to give you clean hands and a pure heart. Separate yourself from your daily routine for awhile so you can dance with Jesus through fasting and prayer. Fasting shakes Heaven, mobilizes angels, and vanquishes the enemy. Fasting works. Do it with a right heart, and fasting will change your life and the lives of others that you’re praying for. If you want to govern in the spirit realm, become a man or woman who knows how to use the weapon of fasting. 7. Decree God’s Word over yourself and others. Speak the things that are not as if they already were. This is one of the biggest ways you implement God’s purposes in your life and see your heart changed. God’s Word is powerful and effectual. When you speak it over yourself, it takes root and births in you both the desire and the power to perform it. I decree in Jesus’ name that I cease from anger and forsake wrath. I do not fret; I know that fretting only causes harm (Psalm 37:8). I am swift to hear, slow to speak, and slow to get angry. I know that the wrath of man does not produce the righteousness of God. I am the righteousness of God in Christ, so I am filled with peace. I decree that I lay aside all filthiness and overflow of wickedness, and I receive with meekness the implanted word, which is able to save my soul. God’s Word will always accomplish the purpose for which God sent it (Isaiah 55:10-11). So speak it over yourself as if it were already true–even before its manifestation becomes evident in your life–and it will manifest. There you go. 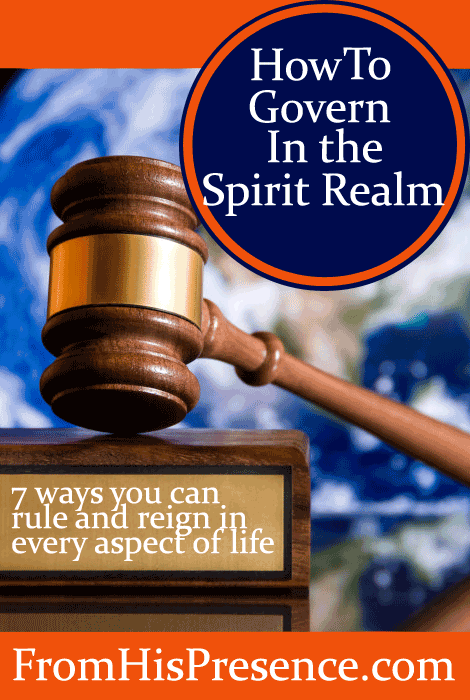 The 7 keys listed above are how to govern in the spirit realm. These are not hard things. They do require purposeful action and choices, but you were made for these things. You were made to govern. If you will do these 7 things consistently in your life, you will see dramatic results as you learn to govern in the spirit realm as God’s representative on earth. Will you take the challenge and begin to exercise the authority Christ died to give you today? AMAZING blog post. This is one I’m going to have to jot notes on and study. Thank you so much for reading, Sherry. I pray these things will continue to add power to your life! Wow, Laurna, that is a wild story. 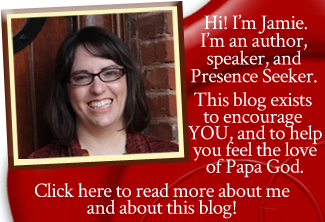 Thanks so much for reading and I’m thrilled that this post blessed you in such a time of need! Yes, and it’s not over yet. I am continuing to keep a fasting mentality and to stand strongly on the promises God has given me about this family. He promised to do amazing, unimaginable things and I believe Him. The layers of evil we are standing against are formidable. Sometime when I have more time I will tell you more. Just want to say thank you again!